2.The Apparel Gift Card may only be used as a method of payment for goods/purchases in Apparel Group stores in UAE and in the local currency in which they are denominated. 3.The Apparel Gift Card can be bought & redeemed across all Apparel Group stores (Except Tim Hortons) in U.A.E. 4.The Apparel Gift Card shall not be redeemed for cash under any circumstances. 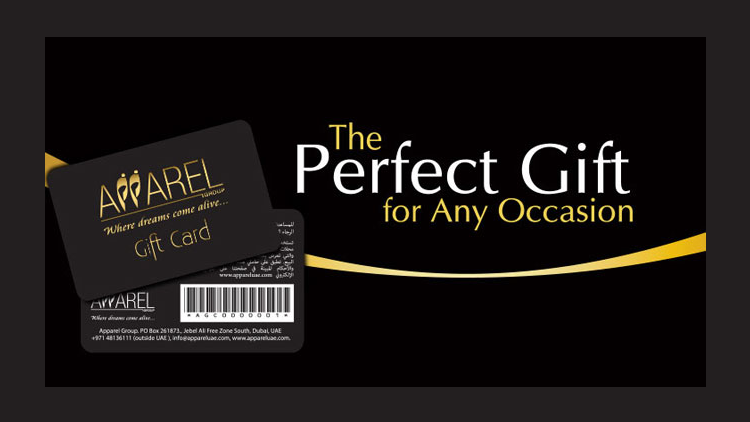 5.Each voucher on the Apparel Gift Card has a validity of 6 months from the date of purchase/top up. 6.If an item is purchased using the Apparel Gift Card, the remaining balance and Apparel Gift Card validity date will be shown on the receipt. 7.The terms and conditions of this gift card shall be amended at any time at the discretion of Apparel Group and shall be binding on the customer. 8.Apparel Group does not accept any responsibility or liability for lost, damaged, stolen or any unauthorized use of these cards. 9.Acceptance of The Apparel Gift Card constitutes acceptance of all of these terms and conditions, changes to which may be effected and published at any time. 10.Money uploaded in an Apparel Gift card is not transferable to another Apparel Gift Card under any circumstances. 11.Refund on purchase of an item shall be made in the original form of payment. Your local statutory rights are not affected. 12.Club Apparel points can be collected on redemption of the gift cards. 13.The Apparel Gift card has to be presented for a refund transaction.